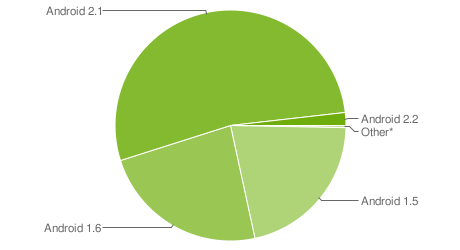 Right on schedule, Google has yet again updated their Android version distribution charts. Android 1.5 and 1.6 have shrunk to a combined 44.8% of the Android population; Android 2.1 and 2.2 devices now represent the majority of the distribution. Android 2.0.1 has all but evaporated in the wild. Android 2.1 is run on 53.1% of Android devices. Fragmentation has long been the buzzword of Android critics and users alike; but it appears that the combined effort to upgrade 1.5 and 1.6 devices to 2.1, in consort with increasing sales of new Android devices worldwide, has provided 2.1 a massive boost in the Android OS share. The limited adoption of 2.2 can be easily explained; the only device to receive an official 2.2 upgrade thus far is the Nexus One, and and that rollout still isn’t complete. Overall, it appears Google is finally getting a handle on the fragmentation ‘bogeyman’; of course, only time will tell if Gingerbread’s eventual release will start the cycle all over again.